The Green BIM Performance Cloud is a unique network not found in other project sharing solutions. Our network offers speeds and advanced data communication analytics that make collaborating on Green BIM a fast and seamless experience. The Problem: From conception, the internet was never designed for speed. The many decades ago that Border Gateway Protocol (BGP) was designed most of the internet was new and there was little difference in speed from point to point. BGP makes decisions about how to route information between locations based purely on “hop” count(shortest distance, not fastest route). 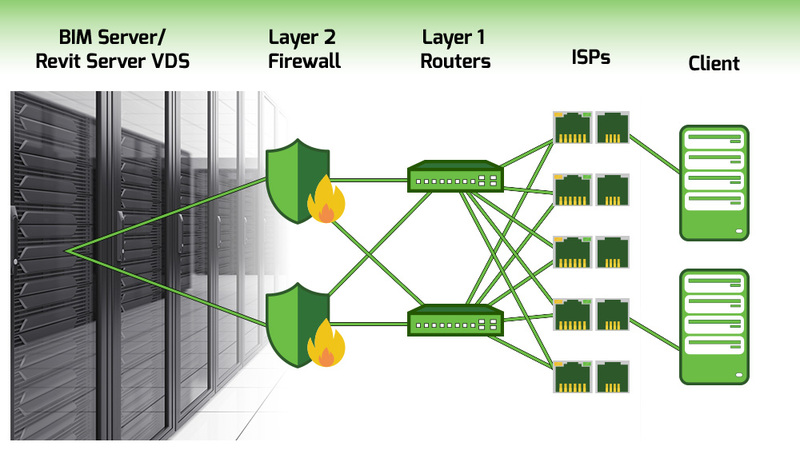 With Green BIMs access to dozens of ISPs, advanced analytics probe and benchmark every destination along the Internet through each bandwidth carrier in the network and continuously adjust the routes for superior web performance optimization so the data reaches the end-user based on the current network conditions. In the Graph above, Team As file server access their BIM Server thru their ISP on the Green BIM network. The BIM Server then communicates the change with Team Bs file server. The communication from the BIM Server is routed thru the best preforming route. Bottlenecks that exist between the two teams are avoided thanks to the Green BIM network, tripling their speeds.